Vocals, guitar, piano, keyboards, synthesizers, harmonica. Stanard "Stan" Ridgway (born April 5, 1954) is an American multi-instrumentalist singer-songwriter and film and television composer known for his distinctive voice, dramatic lyrical narratives, and eclectic solo albums. He was the original lead singer and a founding member of the band Wall of Voodoo. The band was named Wall of Voodoo by Ridgway before their first gig, in reference to a comment made by a friend of Ridgway's, while recording and overdubbing a Kalamazoo Rhythm Ace drum machine—a gift from voice actor Daws Butler. While listening to some of the music that created in the studio, Ridgway jokingly compared the multiple-drum-machine- and Farfisa-organ-laden recordings to Phil Spector's Wall of Sound, whereupon the friend commented it sounded more like a "wall of voodoo" and the name stuck. Wall of Voodoo's music could fairly be described as a cross between early synthesizer pop and Ennio Morricone's soundtracks for Italian director Sergio Leone's epic western films of the 1960s. Adding to the music's distinctiveness was percussive and textural experimentation, i.e. mixing drum machines with unconventional instruments such as pots, pans and various kitchen utensils, raw electronics with interlocking melodic figures as well as twangy spaghetti-western guitar. On top of the mix was Ridgway's unusual vocal style and highly stylized, cinematic narratives heavily influenced by science fiction and film noir, sung from the perspective of ordinary folks and characters wrestling with ironies inside the American Dream. Ridgway embarked on a solo career in 1983, shortly after Wall of Voodoo's appearance at the US Festival that same year. After collaborating on the song, "Don't Box Me In" with Stewart Copeland from the Police for the soundtrack to Francis Ford Coppola's Rumble Fish starring Mickey Rourke, Matt Dillon and Dennis Hopper, he released his first proper solo album, The Big Heat (1986), which included the top 5 European (including UK) hit "Camouflage". This was followed by numerous other solo recordings: Mosquitos (1989), Partyball (1991), Black Diamond (1995), and Anatomy (1999), The Way I Feel Today (1998), a collection of big band standards, and Holiday in Dirt (2002), a compilation of outtakes and previously unreleased songs. Ridgway's album Snakebite: Blacktop Ballads and Fugitive Songs (2005), features the narrative song, "Talkin' Wall Of Voodoo Blues Pt. 1", a history of his former band in song. Since the early days of Wall of Voodoo, Ridgway has been interested in making music for the cinema. A list of films for which Ridgway has written scores and/or original songs is included below. Ridgway's album Holiday in Dirt was a quasi-cinematic project, with the release of the album accompanied by a showing of 14 short films by various independent filmmakers, each film a visual interpretation of one of the songs on the album. A compilation DVD of the films was released in February 2005. 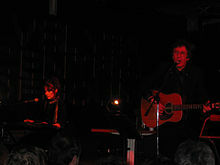 In 1994, Ridgway began work on a new project in the form of a trio called Drywall, the other members of the trio being Ridgway's wife, keyboardist/vocalist Pietra Wexstun of the band Hecate's Angels (who had previously worked with Ridgway on Mosquitos and Partyball), and former Rain Parade drummer Ivan Knight. In 1995, Drywall released its first album (first of a "trilogy of apocalyptic documents"), titled Work the Dumb Oracle. A short film directed by Carlos Grasso titled The Drywall Incident was released the same year. An extended, instrumental soundtrack album for The Drywall Incident was released in 1996. Ridgway and Wexstun also collaborated and forayed into new musical territory, composing a suite of mostly instrumental and orchestral pieces to accompany an exhibition of postmodern surrealist artist Mark Ryden's paintings after being introduced by a mutual friend, Sean P. Riley, who toured with Wall Of Voodoo on their 1982 "Call of the West – Tour of Virtue" as the band's merchandiser. The album was released on CD in 2003 as Blood – Miniature Paintings of Sorrow and Fear in a unique 3-panel packaging design by the artist which quickly sold out of its limited pressing of 7,500. Ridgway plays banjo and harmonica in Wexstun's group Hecate's Angels. 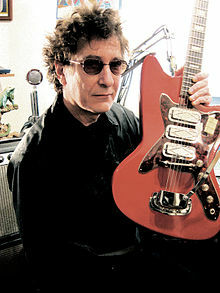 Stan Ridgway and Drywall regrouped in 2006 to release the album Barbeque Babylon, the third "apocalyptic document" with the single "The AARP Is After Me". The new Drywall lineup features Rick King on guitars and bass and Bruce Zelesnik on drums and percussion. In 2008 Ridgway and Wexstun released "Silly Songs For Kids Vol. 1", a collection of children's songs that feature the duo and also saxophonist and woodwind player Ralph Carney. Ridgway has also contributed to albums and projects by producer Hal Willner, Frank Black and the Catholics, the Flesh Eaters, the Divine Horsemen, The Ray Campi Quartet, the Fibonaccis, and Roger McGuinn. September Songs – The Music of Kurt Weill (1994), directed by Larry Weinstein (singer Cannon Song). ^ Mason, Stewart. "Biography: Stan Ridgway". AMG. Retrieved 18 May 2010. "I Wanna Be a Boss"
Wikimedia Commons has media related to Stan Ridgway. This page was last edited on 30 March 2019, at 02:11 (UTC).